The Belgian Tervuren is active and attentive breed that requires exercise both physically and mentally on a daily basis. It relishes in the opportunity to exercise in an outdoor environment. If given enough exercise, this breed makes a great indoor house pet and reliable companion. It is intelligent and has the ability to listen and learn. The Belgian Tervuren can be standoffish with people it does not know and has a tendency to react in a naturally protective way towards its owner. It can be standoffish with people it does not know and has a tendency to try and nip at the heels of small children due to its natural instincts to herd. The Belgian Tervuren needs a high amount of physical exercise each day. This can be achieved through a high-energy play session on a daily basis. This breed loves to herd and any opportunity to do so is taken. It enjoys the opportunity to divide its time between an indoor and outdoor living environment. The Belgian Tervuren enjoys continuous human communication. The coat of this breed needs combing or brushing two times each week and sometimes more during times of coat hair shedding. The major health concern for the Belgian Tervuren is seizures. Minor health concerns for this breed include CHD (Canine Hip Dysplasia), elbow Dysplasia, allergies, hypothyroidism, and PRA (Progressive Retinal Atrophy). On occasion, the Belgian Tervuren experiences pannus, cataracts, hemangiosarcoma, and PPM (Persistent Popullary Membrane). To keep this breed healthy, it is suggested that the hip, eye, and elbow be tested on a regular basis. The life span of a healthy Belgian Tervuren is ten to twelve years of age on average. There are four Belgian shepherd breeds that exist and the Belgian Tervuren is one of the four. All four of the breeds have the same origin but are differentiated by varying types of coat and color. The four Belgian Shepherd breeds are known as the Belgian Tervuren that has long hair, the Laekenois that has wiry hair, the Groenendael with long black hair, and the Malinois that has short hair. All four of these breeds became recognized as one breed, the Belgian Shepherd, in 1891 and continued to be interbred after that time. The Belgian Tervuren earned its name from its origin in an area known as Tervuren. The Belgian Tervuren was not as popular as the other breeds due to its anything but black coat coloring. This breed first arrived in America in the year 1918, but was quickly extinct during the Depression era. The Belgian Tervuren made a comeback after World War II with help from litters of the Malinois breed. The Belgian Shepherd became separated into three different breeds in 1959 and the Belgian Tervuren was one of them. 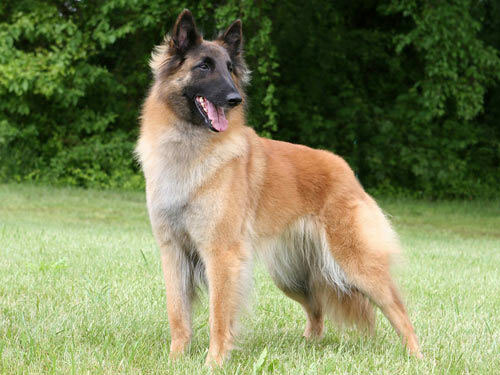 This breed quickly became desirable as it was noted as the most pleasing to the eye out of the Belgian Shepherd breeds. The Belgian Tervuren is utilized mostly in herding, while the other Belgian Shepherd breeds continue to be used for guard work.